From: Pep Pla, Marc Angelet. Directed by: Pep Pla. 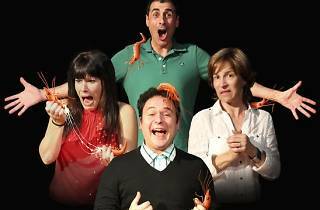 With: Rosa Cadafalch, Xavi Francés, Mercè Martínez, Lluís Villanueva. Have you never heard tell of the zebra prawns from the Gurb Delta? Well, you may be the only ones still not aware that this crustacean is seriously endangered due to the use of pesticides and waste discharges into rivers. An association to protect them has even been established. It's a small association, but it's led by a number of activists devoted body and soul to the cause, collecting signatures, selling T-shirts and organising demonstrations. All to save the zebra prawn in the Gurb Delta. Solidarity and business, ideals and institutionalisation, honesty and marketing... Marc Angelet talks about all this, and about how badly certain words go together. 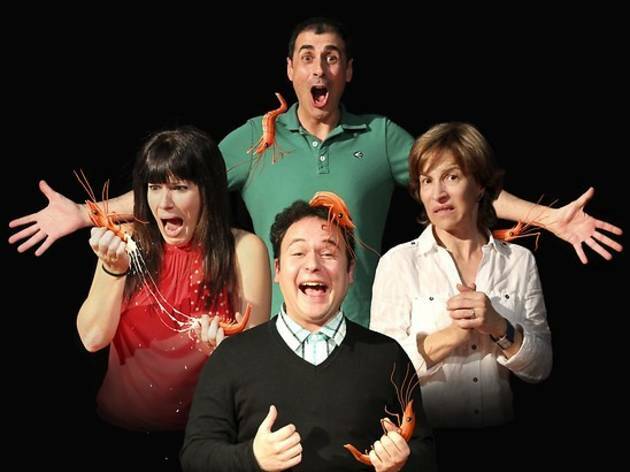 In 'Els eufòrics', Angelet, the author of such works as 'McBeth con queso', 'El biògraf', 'Voyager' and, more recently, the technological comedy 'eGo', teams up with the actor and director Pep Pla, who staged a version of 'Zero' at the Grec in 2012 and has been director of the Terrassa Centre for the Performing Arts (Centre d’Arts Escèniques de Terrassa, CAET) since 2006.